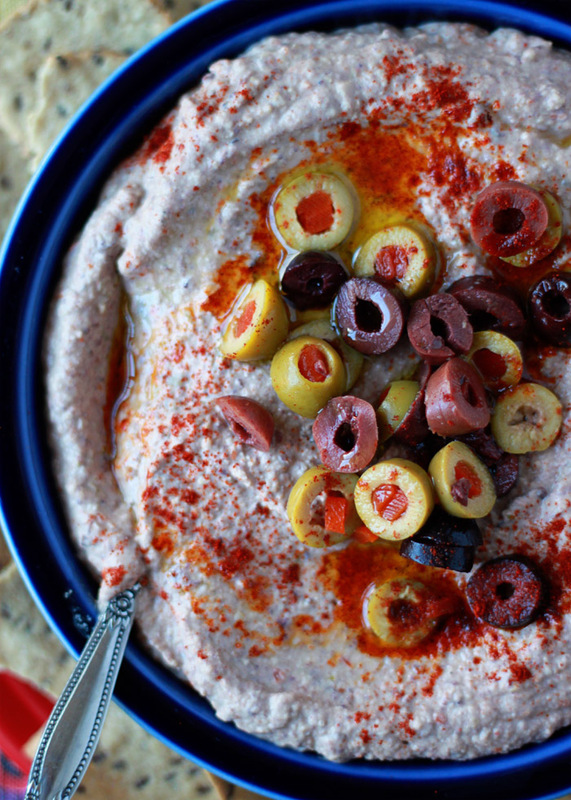 Salty kalamatas and pimento-stuffed green olives lend a little pizzazz to plain ol’ hummus. This started out as the slightly more exciting “Three Olive Hummus,” but when I realized I was out of plain black olives, I went with two olives instead. And it was just as tasty, so I went with it. 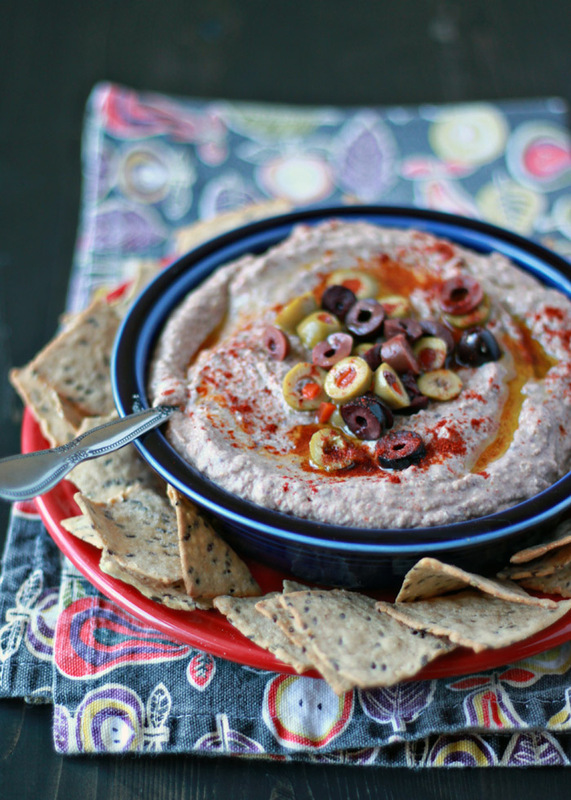 “Two Olive Hummus,” though, doesn’t have quite the same ring to it, so just plain “Olive Hummus” it is! 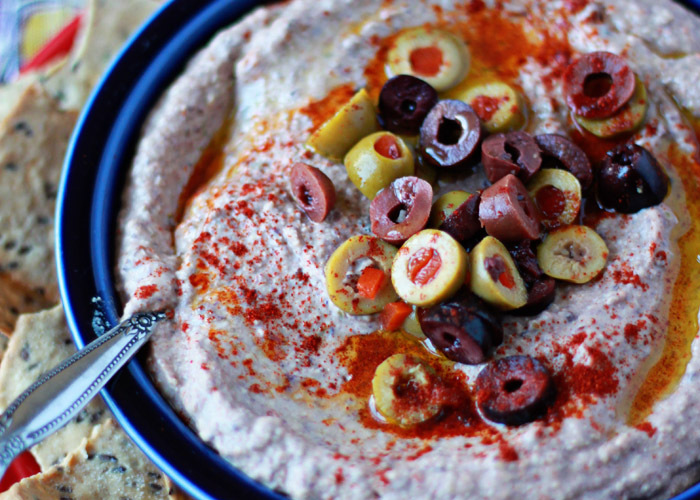 Except this simple hummus recipe really doesn’t taste plain at all. It’s … sort of like hummus amped up with a little tapenade. Except simpler. And a little more interesting and colorful than your standard hummus. 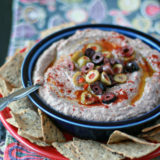 Served with multigrain chips, red bell pepper slices, or carrot sticks, olive hummus makes a great game-day appetizer or any-day snack for anyone. Except for my guy, who hates olives. And my toddler, who won’t touch hummus these days. Ah well. More for me! To the bowl of a food processor or high-powered blender, add the chickpeas, tahini, lemon juice, garlic, and 1/2 teaspoon salt. Pulse, adding the liquid from the beans as needed to keep things moving, until the hummus is very smooth. Add the olives and pulse until chopped. I like to whirr them almost completely in; you may prefer a chunkier hummus. Taste and add additional salt if desired. Scoop into a serving bowl and top with additional sliced olives, a sprinkle of smoked paprika, and a drizzle of olive oil, if desired. I’ve got an olive hummus coming up on the blog this month — I am constantly looking for new and improved versions of my favorite appetizer — your photos are spectacular! 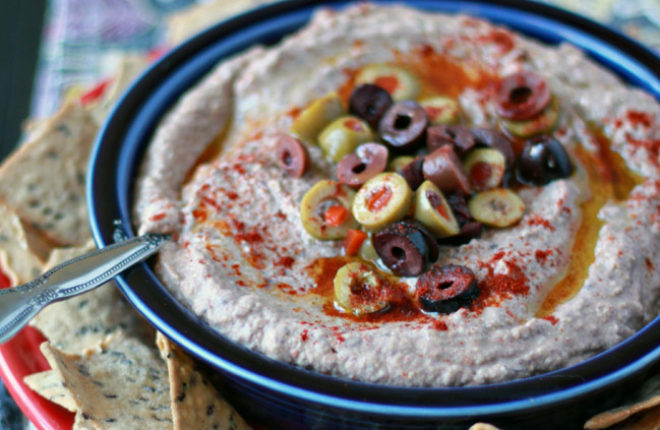 As a HUGE olive fan, I would be hanging all over this two olive hummus at any holiday party. Definitely going to have to make this very soon! I hope this is the gem I think it is. I am making this for a Christmas gathering this Sunday 12/214/17. I’ll let you know what everyone thinks! Thanks for posting this! Wow this is great! The only thing I did different is I used a bit of liquid from the kalamata and green olives instead of the chick peas. Definitely a winner!